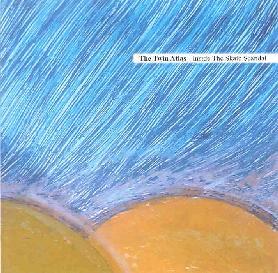 The Twin Atlas - "Inside The Skate Scandal"
Sean Byrne and Luke Zaleski present their sixth album here, the first for me. It's 12 songs of dreamy pop tunes, layered and spacey enough to suit psyche fans; catchy, light and understated enough to suit college/indie-rock fans. And I love it. There are obvious folksy '60s/Byrds-type influences, with lots of nice, airy vocal harmonies (though with one dominant voice). The tunes average about 3 minutes. There's one cover tune - the B52's "Legal Tender", which doesn't stretch at all to meet the duo's original style; actually, it's one of the album's best. Instrumentation is mainly acoustic and subtle mind-massaging electric guit, light keys and a very basic, low-mixed rhythm section. Perfect music for a mild California coast town like mine. The spaciest bit is also the shortest. "Don't Diss this Song" is 1:45 of melody drenched in samples and space. "Plan to Erase" may be the champ with its sublimely smooth chorus. "Skyline" scatters the sounds a bit with some lively Spanish-type guit and zylophone. Their sound overall might be characterized as "light, and yet always somber". The closing instrumental "It Will Pass" has some (relatively) energetic drum-work and Floydish guitar, along similar lines to Porcupine Tree. I already said I loved it in the first paragraph, so get with the Atlas. For more information you can visit The Twin Atlas web site at: http://www.thetwinatlas.com. Inside The Skate Scandal is distributed by North Of January. You can visit their web site at: http://www.northofjanuary.com. Contact via snail mail c/o North Of January; PO Box 5691; Burlington, VT 05402.